I have this plaque in my closet. What this means to me is that if you don’t know what kind of attire is appropriate for the day or an event you are attending, it’s always better to overdress. Some people may not feel the same way as I do and that’s okay. I love fashion and putting outfits together based on things I see in magazines and on the Pinterest® app. I base my outfits on the weather, what meetings I have or what events are going on that day. I try to always be prepared with my outfit. We should all be so prepared for our day from the spiritual sense as well. In Ephesians 6, Paul gives us the wardrobe for the day that we need to wear to be ready for the devil’s schemes. It’s the whole outfit – the full ensemble from head to toe. The helmet of salvation, the breastplate of righteousness, the belt of truth, the shoes of the gospel, the shield of faith, the sword of the Spirit, and prayer to top it off. As prepared as I love to be for the day with my physical outfit, it’s more important to be sure that I am prepared for the unscheduled meetings that the devil holds, the events that he creates that are not on my calendar and the cloudy weather that the stupid evil one loves to throw into my day. I can be dressed to the nines when I am ready with the armor of God and covered in prayer. The devil may decide to leave me alone today but I’d rather be overdressed and prepared than to be caught without my armor on. Because as soon as I don’t have my rain jacket, he will bring on the storm. Actually, now that I think about it, the outfit on Paul’s “Pinterest” account is way better than the leopard print top and hot pink shoes that I had planned for today anyway! Have a great one! 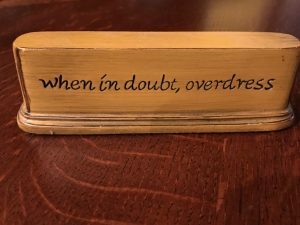 This entry was posted on September 11, 2017 with tags: #armorofGodstudy, #fashion, #makeadifferenceeveryday, #overdressed, #pinterest by Deanna Young.